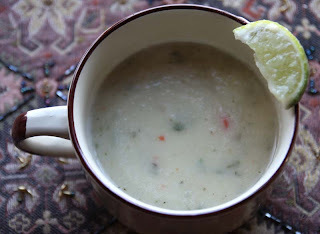 So here is a bonus recipe for the day: Celeriac and coriander soup. I had some celeriac left over from the Celeriac and Brown rice Gratin I made earlier. Again, not one to waste I made a soup . I liked the soup, so did D saying it was 'rich, creamy and flavourful', but he did have a little criticism. As much as he likes citrus and sharp flavours, he thought I was a little too generous with the lime juice towards the end. I also added coriander to the soup, only because I had some in the fridge but if your not keen on coriander, you could easily substitute this with parsley or omit it all together. 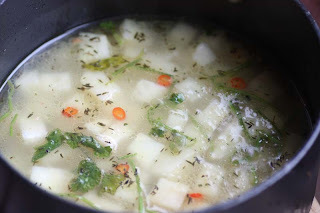 Heat the oil and cook the celeriac gently in a saucepan for 10 minutes, without colouring. Add the stock, ginger, thyme, chilli, coriander stems and half of the juice from the lime. Bring to the boil and simmer covered for 30 minutes until the vegetables are tender. Remove from the heat and add the creamed coconut. Cool a little, then puree in a liquidiser until smooth. Taste for seasoning. Reheat gently, stir in the remaining lime juice to taste and the coriander leaves and serve. Adapted from Covent Garden Soups. That looks delicious - I don't think celeriac is available here...what do you think about subbing celery...? I tried growing celeriac last year but they only grew as big as a golf ball! These are flavours I really like together... coriander, lime, coconut, hot bit of chilli pepper. Never thought to use celeriac though and it isn't a vegetable I grow. Must look into that. Thanks Mango Cheeks. I like this. You may know celeriac as celery root. I don't think celery woudl be a good sub, as it is completely different in flavour. Sorry. Sorry to read that your celeriac didn't grow well. Please do buy some right now as its at its best. So so pleased to read your liking this soup. mangocheeks - this looks just so nice. I'm putting it aside for when our weather cools down enough for soup. I don't think I have ever used celeriac before, but I have seen it. Thanks - you are a powerhouse of inspiration! Looks delicious! Love creamy soups. Thank you so much Duchess_declutter. I do hope you get round to trying this veg. Oh yes please and I would have had D's share had I been there, I love things with a citrus bite. You would have been more than welcome. Always such inventive flavour combinations mangocheeks! I have a celeriac and some limes in the fridge, perhaps I should buy some corinader?! Yummy! You can replace the coriander with parsley if its easier to get hold of. You can mash it too if your so wish, otherwise rough chunks should be okay. Only drawback the stock won't be as thick.